For some reason I have a lot of friends who turn to me for career advice. I don’t think it’s so much that they’re trying to emulate anything in particular that I’ve done; it’s just that I’m a pretty decent listener about this stuff (particularly when they’re the ones buying dinner and we’re on the 2nd bottle of wine), and once in awhile I offer a bit of advice that they seem to find helpful. 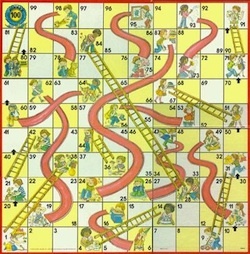 As I’ve thought this through, I’ve come to the conclusion that career management is like a variation of the classic kids game Chutes and Ladders. Remember that? In the classic game, ladders advance you and chutes set you back. My version is a little different: chutes and ladders can both connect you to future opportunities. Chutes represent continuity & transferring skills or knowledge from a previous position. They represent the things you’ve already done that can get you a new job. Ladders involve doing something different to broaden your skill set and give you more options in the future. 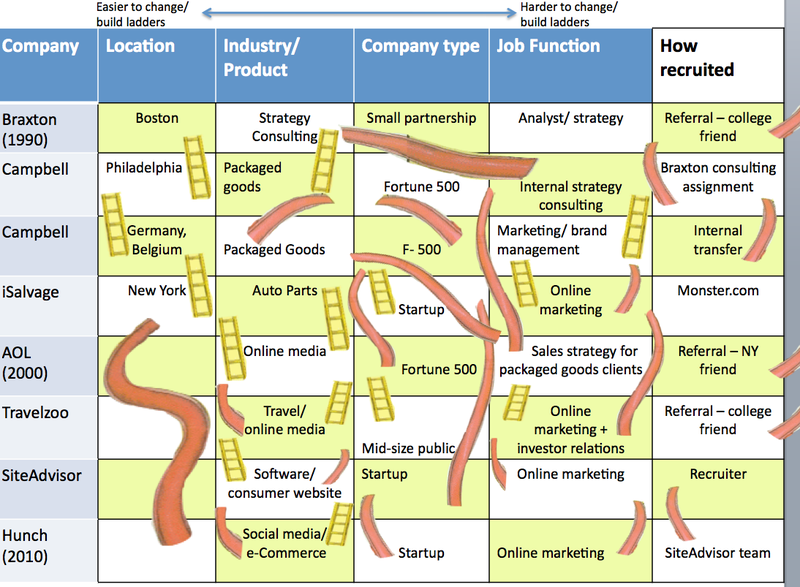 The columns on the game board represent the location, industry/product, company type, function, and recruiting method for companies that interest you. Chronology starts at the top (with your first job) and moves down the board. Notice how the early career chutes just connect to adjacent jobs, but later on, chutes begin to lengthen and span multiple connections. My AOL job drew on my experience as a brand manager at Campbell (2 jobs prior). When I interviewed for SiteAdvisor, I was able to convince Chris Dixon that I had startup cred by pointing to my experience at iSalvage (3 jobs prior). This is why it’s important to build ladders as soon as you can; they enable future chutes, and it gets harder to build new ladders as you get more and more senior. Notice also how there are a lot of incoming chutes in the ‘How Recruited’ column. They come mostly from friends and networking, which is of course consistent with what every career counselor in the world tells you every 5 minutes. Finally, note that you can have both a chute and a ladder connect something at the same time. When possible, try to use a chute to leverage what you’ve done while also building a ladder to broaden your responsibilities. Example: my move to Travelzoo drew on my existing online marketing background but also broadened it to include investor relations. -> this happens when people try to change too much at the same time, which can either prevent you from getting hired or set you up for failure if you talk your way into a job. When friends want to change too much all at once, I encourage them to consider an alternative 3 or 4 year plan that involves 2 steps, so their chutes can be used to earn some ladders. I’m not suggesting for a second that I had a master plan in place throughout my 20 year career, but by applying the chutes and ladders principle to job changes, I ended up with a lot of great options, continued to build my skill set, and am fortunate to be in a rewarding and challenging job today (which incidentally has almost nothing to do with how I started my career). Now that you know far more than you care to about my career, the key is to apply this to your own. Map out where you are, where you want to be, and then begin to connect the squares with your chutes and ladders. This entry was posted in Uncategorized and tagged career planning, career transition. Bookmark the permalink. I was more of a Hungry Hungry Hippos kid, but Chutes and Ladders works better in this case. Clever analogy and good advice to inventory career skills and experiences, including those built outside of the workplace. Ladders could be built along freelance projects, volunteer work, and personal pursuits. It’s just a matter of taking the time to reflect and position them for the future.